Barrington Lewis: Barry Gets A Dollar - Published! Barry Gets A Dollar - Published! with several publishers simultaneously is tiresome! 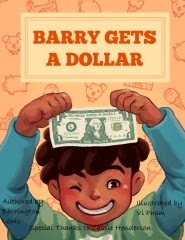 Nevertheless, I'm happy to say that at least one accomplishment is down in the history books - and that is Barry Gets A Dollar has been finally picked up/published by Createspace. It will soon be published on Amazon, Kindle, and a few stores between now and January 2014. I hope you enjoy this financial literacy book designed for your kids learning and fulfillment into the world of money. Please leave your feedback and comments on Amazon!